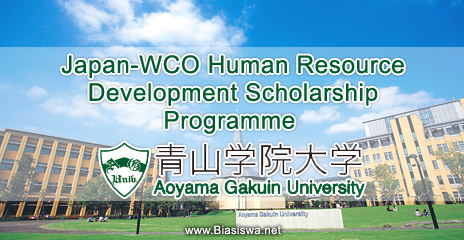 The Japan-WCO Human Resource Development Programme (Scholarship Programme) provides grants to enable promising young Customs managers from a developing country member of the WCO to undertake Master's level studies at the Aoyama Gakuin University (AGU) in Tokyo, Japan. Level of study: Scholarships are available for pursuing master degree programme. Available Subject: Scholarships are awarded in Strategic Management and Intellectual Property Rights (IPR) programme. Scholarship Values: A monthly stipend covers accommodations, meals, transportations, and other expenses. It cannot be increased to cover family members if any. The amount of the stipend is subject to change according to the decision of the Japanese Government. Admission and tuition fees. Eligible Nationalities: Citizens of developing member of the WCO are eligible to apply. Policies: If the performance of scholars falls below a certain critical standard (e.g., failing a required course, or one that is important in the curricula), or scholars are unable to continue with schoolwork for any reason whatsoever, we may terminate provision of the scholarship, even during the school year. In the event of such an occurrence, scholars may also not be provided with a return air ticket.